Managed to get the last ride of the season in today. It was cold and sunny so I returned to the spot I found on my last ride overlooking Bardolino and Lake Garda, this time with my camera. After some MTBers passed me giving me some strange looks for being o the gravel road it was picture taking time. The lighting was perfect, for a few moments the sunlight reflected on the small harbor at Bardolino like a searchlight. Hope everyone has a nice New Year's Eve, and a great New Year! Today was the coldest day we've had since we've been here, 2 years +. But, it was wonderfully sunny so I went for a solo rode at 9 a.m., mainly because no one else was at the starting point. Start time temperature was -6C. I rode along the Adige, to Parona, Pescantina, a short climb up to a plateau before the descent into Bardolino. Wednesday, Eros had told me that at this time of the year the focus should be on "agilita" (agility). So I was concentrating on spinning. On the plateau a strong young guy blew by me and thoughts of spinning gave way to jumping on his wheel. Into the 52 I went and we were off. God, he was fast. I managed to stay on his wheel all the way to Bardolino. My HR was up there, confirmed when I arrived home. Eros had also made a point that when it's cold it's not a good idea to go into a bar and get too warm and then re-start. So, my espresso stop resembled more of a Formula 1 pit stop today. Departing the Tam Tam Coffee Bar (the current owners don't know where the name comes from) I saw a pro team followed by their team car whizzing by but I was too far to see who it was. After that there was another short climb and I detoured onto a very narrow road which took me along a ridge which offered fantastic views of Lake Garda. I need to go back with my camera. I couldn't continue on this road is it became dirt and gravel. Thoughts turned to a cyclocross or mountain bike. A corner of our apartment already looks like a bike shop so I turned any ideas about that OFF. Monte Baldo, which runs along Lake Garda, has an extensive system of ride trails that would be nice to explore. After that I maintained a steady pace all the way back to Verona. Nice day, nice ride. There are times I enjoy riding alone. I was so lucky to have found such a great bunch of people. Photos: Spring (in Verona when our club sponsored a raduno), Summer (2 photos in Puglia), Fall (in an old village in Emilia Romagna). Or, another title might be, You Can't Be Stopping For Espresso. Today, the day after Christmas, is another holiday here in Italy, La Festa di Santo Stefano. After stuffing myself royally yesterday I received an SMS : Ride tomorrow, 1000. Only 10 people showed up. I guess I wasn't only the only one that stuffed himself. I noted that the average of the group was about 30 years younger than me. That didn't bode well. 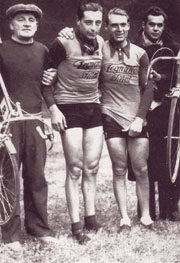 Eros cheerily announced, "No Bardolino today, we'll do the '3 Climbs' ride. It's a beautiful sunny day and the route will be in the sun." Ohh noooo, not climbing! My body has been accustomed over the last 2 months to the somewhat flatish ride to Bardolino and vicinity, lingering long over an espresso, and a leisurely pedal to lunch. I just knew we were not even going to be stopping for an espresso on this ride. I was right. As we were never far from Verona the climbs are not like climbing in the Dolomites but they do feature switchbacks. The pace was high which meant no resting for me. We passed through Corrubbio, a short climb. The next climb was tougher, called the "Pendola". The last, and longest climb was the climb from Negrar to Montecchio. After that it was a very long descent to Verona. I was glad I wore my HRM, something I'm going to try to do more often. Hope you had a nice ride where ever you are. Several of us from Gruppo 1 that had been on Eros' France trips joined his Saturday 9:00 a.m. ride to Bardolino on a beautiful, brisk, morning. The ride starts at the diga (dam) by the Adige River so I was bundled up in a 90s Motorola Team winter jacket. Eros arrived riding in an elf cap which brought smiles. It was an easy going ride, with 50+ riders, that gave everyone an opportunity to exchange holiday greetings. At Bardolino, Paolo Rosola and his partner Paola Pezzo(in life and business, they own the Paolo Pezzo Olympic Bike Center in Bardolino) had set-up a nice stand near the shore of Lago di Garda where everyone enjoyed some vin brulee and pandora. We posed for some photographs, chatted about this year's adventures and plans for next year. Our evening finished with a performance at the Teatro Filarmonico di Verona of Beethoven's Symphony n. 9 in D minor op. 125 with solos and chorus. The conductor was Boris Brott who was superb. 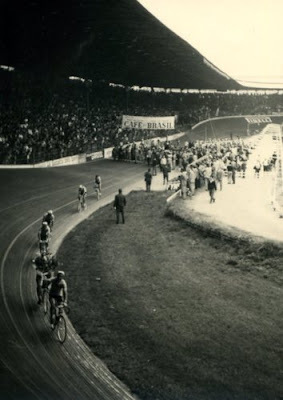 The famous Vigorelli track, also known as the home of Masi, may be finding a new life. A new, covered, Vigorelli has been proposed which will cost 50 million Euro and 3 years to build. It will re-launch track racing but will also have the capability of hosting other sports such as basketball, tennis, boxing, hockey, and concerts. 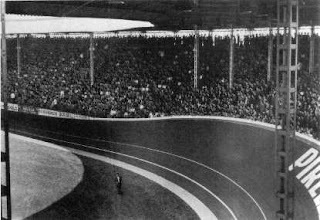 The proposal for a sports palace was presented to the mayor of Milano in July and has been shrouded in silence and mystery since then. The first objective is not to change the exterior. The second is to install a bubble roof. 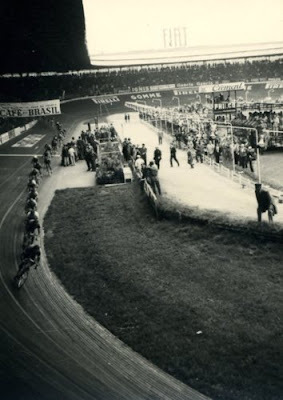 A new track will be installed of 250 meters in length in order to comply with World Championship regulations; when the Vigorelli was built in 1935 it was 397.57 meters in length with 45 degrees banks in the corners (84 records were established on this track). For track venues the capacity will be 10,000 spectators. UPDATE 22 December: Paolo's inbox has been sizzling with mail. With Christmas in 3 days he is very busy with Christmas shoppers. He will be replying to all emails later next week. If you are interested in more information do write so he can begin to understand how much interest there is. All of these frames will be made one by one. 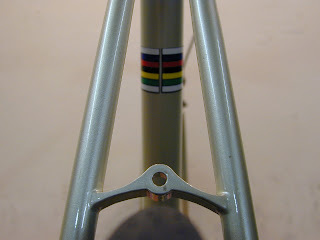 UPDATE 28 December: I took some better photos, less cluttered, of Paolo's bike today. Please look at the end of this blog entry. 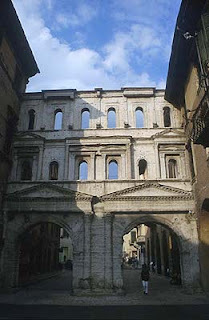 Chesini is located in the historic center of Verona (at Via San Paolo 8/10) near Ponte Navi. In January, 2006 I met and interviewed Paolo, one of the partners. Since I was doing the interview for http://www.classicrendezvous.com/ the focus of the interview was on the pre-1983 period to conform with the interests of classicrendezvous. 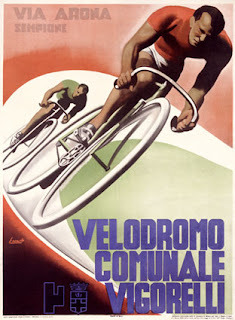 Chesini was founded in 1925 by Gelmino Chesini who had been a bicycle mechanic before he began building bicycles. The first business location was in Nesente on the outskirts of Verona, later moving to Verona. He developed what became a well known slogan in Verona,"O Chesini o cammini". 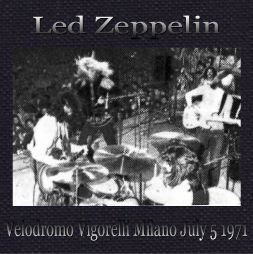 The son, Gabriele Chesini, continued the business. 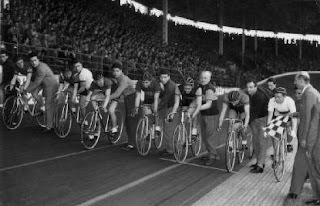 Chesini built bikes only for their own brand and were not a sub-contractor for another brand at any time. They also performed their own pantographing. Photos of their manufacturing facilities in the 1980s show a very impressive capability. Large numbers of Chesini's were sold in Europe, particularly in Austria, Germany, and other European countries through representatives. A much smaller number were sold to the USA. Perhaps some of my enthusiasm for steel lugged bikes rubbed off on Paolo because this summer he surprised me with a beautiful custom fixed gear frame he had built for himself. 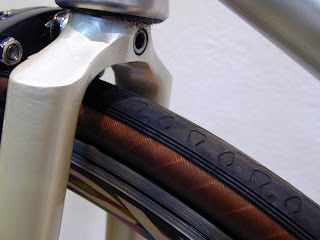 He had contacted one of the best Chesini builders from decades ago and located sets of Columbus tubing and lugs. The builder built a beautiful frame. The frame has ovalized top and down tubes (identified as SPX), track ends, sloping crown fork, and for getting around Verona drilled fork and rear brake bridge. Paolo then built it up with Miche (an Italian company) fixed gear components, Brooks saddle, and other nice touches. Paolo would like to build and sell these frames/forks (complete bikes are also possible) until the tubes and lugs are exhausted. Each will be custom (top tube and seat tube sizing) and could be ordered, for example, without drilling, without a brake bridge, and combinations as desired. frame/fork (painted!! ): 495 Euro + shipping. I know, the $ conversion hurts and shipping isn't going to be inexpensive but a great deal nevertheless. For persons in the EU zone it's a great offer. Complete bikes: from 1,100 to 1,400 Euro subject to component selection. Disclaimer: Transactions are solely between the buyer and Chesini. Can You Get a Cappuccino Like This? It was cold this morning. But, it's Wednesday! The day we ride no matter what unless we can't see because of fog in the winter, or rain (it very rarely snows in Verona). Riding to the meeting point Eros passed me in his car and stopped to say hello. He gave me another cycling lesson: my winter jacket was too loose, he said it should be tight in order to keep me warm. He told me the same about my summer clothing during the summer so it can transfer the sweat. The message is : tight! Between loosing weight and the USA style of wearing somewhat loose cycling clothes I don't look quite the part here where things are worn very, very close. Eight of us did the nice ride to Bardolino and finished the day with lunch at Boscomantico. Today I had pasta with a sauce made with crushed pistachio and almonds. Fantastic. Hopefully, Saturday will be a beautiful day as well. Eros, along with Paolo Rosolo, has planned a get together at the main piazza of Bardolino for a BIG group photo and to celebrate the Christmas season with "vin brulee" (a hot mulled wine) and "pandoro" (a traditional Italian sweet yeast bread that is made here in Verona and is most popular around Christmas and New Year. Pandoro is traditionally shaped like a frustum with a 8 points-star section). Photos: my cappuccino, Porta Borsari, announcement for the Saturday ride.